Orange flavored cookies loaded with creamy white chocolate chips and crunchy walnuts. 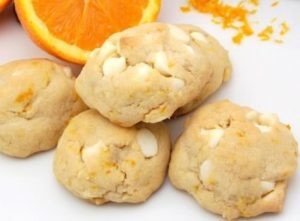 Here's an easy dessert recipe for Orange and White Chocolate Chip Cookies. In medium bowl, combine flour, baking soda and salt together. Set aside. In large bowl, cream butter and sugars together with an electric mixer until light and fluffy. Beat in egg and grated orange peel. Add the flour mixture to butter mixture and stir to just combine. Stir in white chocolate chips and chopped walnuts. Drop by tablespoonful onto an ungreased baking sheet. Bake for 10 to 12 minutes, turning baking sheet around at the halfway point to ensure even browning. Let stand for 2 minutes than remove to racks to finish cooling. Store Orange and White Chocolate Chip Cookies in air-tight containers.